“Come up with new UX driven concepts for operating a crane, utilizing e.g. wearables or augmented reality.” Konecranes is quite interested in developing new ways of utilizing emerging technologies in their products. Now they are researching the possibilities of AR and wish to be the first company to launch a functioning system to be implemented in crane industry. We focused on the controlling an electronic overhead trolley (EOT) and the experiences related to it. Our experience goals have been developed to make the operator feels one with crane. Achieving this experience would ensure that it meets practically all the Konecranes. Situational awareness – It must be clear what is the status and how the user interaction is going to affect to the crane and to the context. Trustworthy – User must be able to rely on the product that it is not going to fail or do something unpredictable. Safety – Users must feel safe when using a product or service. Feeling of control – Fit to work product must support smooth work flows enabling effective and rewarding working. Informative – Necessary information should be appropriately highlighted and available at all times. Unnecessary information should be hidden. Smart – Creating clever simplicity and inbuilt intelligence making complicated tasks feel simple. Empowering – Making users feel professional and skillful. The design principle in our applicable solution is that the user interface should be close to or in the crane operator’s body. The operators own senses are enhanced, or augmented, so that the crane operator is more able to do some important tasks, such as noticing objects of interest or dangers. Also the logic for operation is always the same regarding the users own body and perspective. There is no need to do small nudging movements with the joystick to test which direction is which. 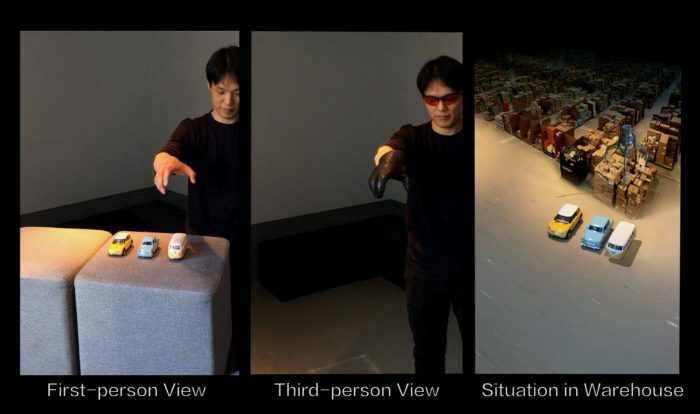 Main feature – Drawing and Shadowing: Drawing means that the operator can draw the path for the hook with virtual augmented reality pointer originating from the controller. This resembles pointing with a finger in real life which is something everyone can intuitively do. Shadowing means that the crane is able to mimic operator’s movements, like the operators shadow. If the operator is in this mode and walks 15 meters with the crane ahead (with the button pressed) the crane will be at the exact same position relative to operator. Here the purpose was to craft a design that would achieve the experience goal without any compromises. 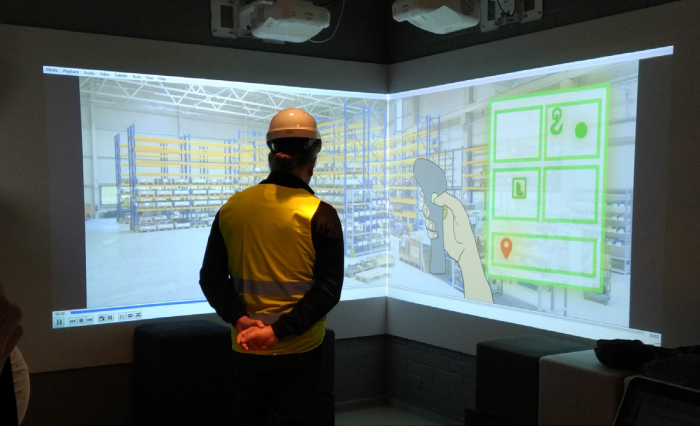 The idea is that the operator is located in empty room and has haptic augmentation in hand and glasses that enable the user to see the warehouse from more or less the cranes perspective. The operators feel and see everything as though he is a giant crane. The lifting device will do the same motions as the operator’s hand. The operator feels resistance, weight in his hand. The haptic engine also restricts the movement to the cranes maximum speed, so the hand movement and the hook movement will be mapped one to one.